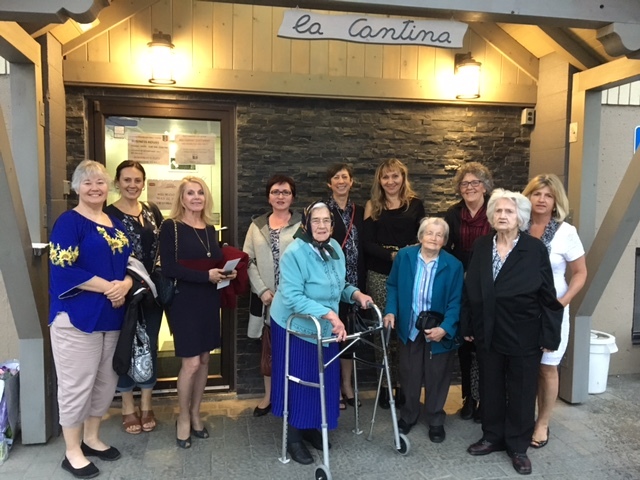 On May 12, 2017, the League organized a ladies dinner to honour the senior members of our organization! Katrusia Bohdan chauffeured the three ladies to the restaurant where a delicious meal was served. The general membership had a chance to thank Maria Danylchuk, Kateryna Moroz and Anna Sadiwnyk for their 50+ years commitment and dedication to the Ukrainian community in Calgary. They were presented with roses and many hugs and kisses. This event also allowed the membership to extend its appreciation and farewell to past President Oksana Kuzyshyn, who will be moving to Montreal this summer. As a token of appreciation for her energy and outstanding leadership, flowers, an icon and a set of pearls were presented. Much laughter and joking was shared during the evening, not to mention a tear or two. It was a special get together and lovely evening!